Spending time during Reek Week in Westport Co Mayo amongst the pilgrims about to climb Croagh Patrick is something everyone in Ireland should experience at least once. A few summers ago, I was fortunate enough to be there to deliver a lecture but, in the end, I learned far more from the people around me than I contributed to the community. For the most part, the people I spoke to were not representing as Roman Catholic pilgrims as such. They were there in order to gain a deeper connection with themselves and with the natural world around them. It is not difficult for them to immerse themselves with their fellow climbers and pilgrims. Hovering over the Atlantic Ocean, this holy mountain’s setting on the west coast of Ireland is as ideal as any spiritual location found in the world. The relationship that some climbers create between themselves and St Patrick had less to do with him as a saint as it had to do with his lasting presence on the landscape. I was asked "how does it feel to collect aspects of folk religion in a post-Christian world?" As a collector of folklore and vernacular culture, I had never asked myself that particular question nor had I realised that was what I was finding. As a folklorist, my attention has been given to the religious activities which occur outside the official church. Although the connection with the church was always in the background, it was not where our focus fell. This question of a post-Christian nation made me rethink about how the relevance of the saints with the Irish community remained. Perhaps Ireland’s connection to its saints could be seen to have a stronger relationship with the natural environment than it does to the buildings that carry their names. 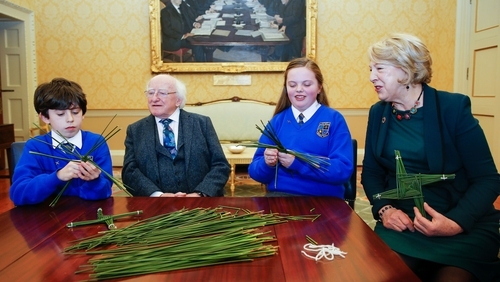 Let's look at two Irish saints whose days occur in February, St Brigid and St Gobnait. It is such a relief at this time of year to experience the darkness of our days pulling back ever so slowly. Every evening, there is just that bit more light as we commute home from our day. Many of us may not be actively involved in agricultural work as would have once been but we are still pleased to see that spring has arrived. Brigid is traditionally know for being the patron saint for cattle, dairy products and children. A special meal could be prepared to celebrate the beginning of the sowing season on the last day of January into the first day of February. Families would vocally invite Brigid into the house. Often the eldest daughter would go outside and knock three times requesting "téighidh sibh ar mhur nglúna, déanaidh sibh umhlaíocht, agus ligigidh Bríd Bheannachtach isteach" (go down on your knees, give homage, and let Blessed Bríd enter the house). After this was said, the final response would be "o, tar isteach, tá céad fáilte romhat!" (oh, come in, you are a hundred times welcome!). There may have been a strong belief that Brigid’s spirit physically travelled across the land, blessing those that left parts of her cloak outside for her. These would be used throughout the year afterwards often to cure headaches and other ailments. Her curative powers are only one aspect which draws so many to invoke the saint. Along with a strong, nurturing nature her kindness was often noted. Bedtime prayers calling on the protective powers of Matthew, Mark, Luke and John were said to be spoken by Brigid the first time she arrived in Ireland, when it felt like a foreign land to her. This almost vulnerable image of the saint allows those to feel closer to her. To help themselves feel less afraid in the darkness of night. If on the one hand she could appear fragile, do not be mistaken because, on the other hand, her courage can act as a beacon for not allowing what others think to bother oneself. There is another strong Irish female saint to mention. St Gobnait’s Day is February 11th and she was no less kind and powerful than Brigid. Celebrated locally around Cork and Kerry, her connection to bees and honey, like Brigid was connected with cows and dairy, also reflects that hold over the natural world. This connection to the world outside and around us validates her acceptance to nature and raises her status. Legend has it that she too looked over children and was able to perform miracles to bring young ones back to health. One’s wellbeing brings us back to the present. If we explore what those who engage in the secular, spiritual world of today are seeking, we will find it is to give strength to one’s everyday and an overall healthiness and vigour. The power of story as portrayed in the lives and legends of the saints can act as a portal into what is possible. It is not the outlandish acts of the miracle that remain important, but what lies behind the magic. The act of caring is exhibited again and again. To make right with what may be seen as the blemishes of the world. To give strength to those that feel, at times, helpless or alone. Again, it is important to highlight the robust feminine nature that has been apart of Irish culture from at least the early medieval period, if not further back. To embrace and re-engage with these tales shines light into the future as we enjoy the ever increasing stretch in the day. Dr Kelly Fitzgerald is a lecturer at the School of Irish, Celtic Studies and Folklore and assistant director of the Mícheál Ó Cléirigh Institute at UCD. Dr Fitzgerald will be a guest on The Leap of Faith tonight (Friday February 1st) on RTÉ Radio 1 at 10pm.